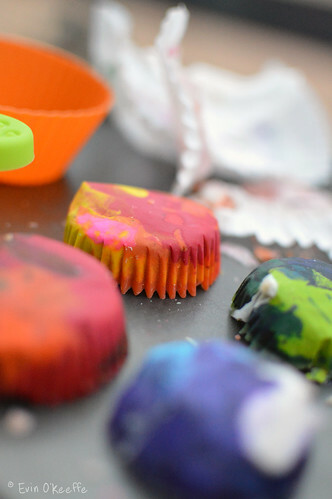 Remember a few months ago when I used the broken bits of crayon to make a new crayon (I even wrote a blog post)? 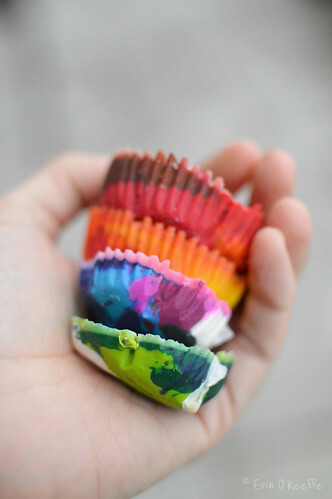 Well, after that I thought that if I ever did it again, I would certainly separate the hues to create a more vibrant phoenix crayon instead of the muddiness of putting the blue, green, orange, purple, and yellow into the same melty new crayon. And you know what? I did just that! 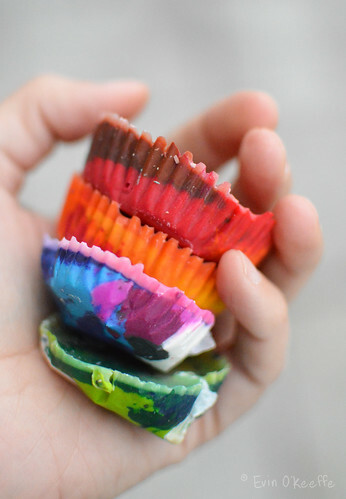 Here are the original instructions which I followed exactly, except this time I placed the bits into four separate cupcake liners based on color and put them in there with a bit of a gradient manner. Fresh from the oven, I snapped this photo. I put the entire tray carefully (VERY CAREFULLY) outside on the patio so they would cool quickly and away from LB who is more and more involved in everything. 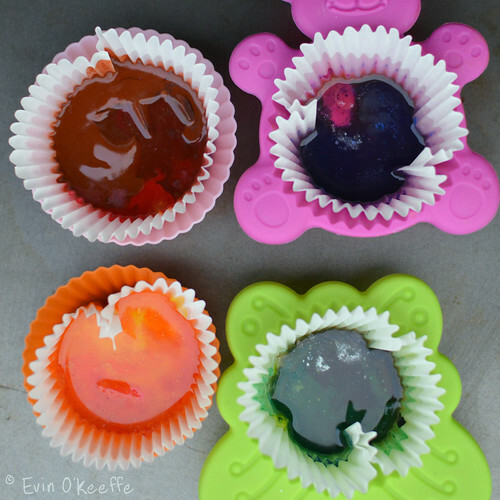 You can see there is a melty goo, but still some solid chunks too. This is an ideal combination since it means the colors retain their original individuality but blend a bit to create a new block shape. I had a couple white crayons and put bits in each of the blocks since it adds a nice neutral calming area in an otherwise busy block. 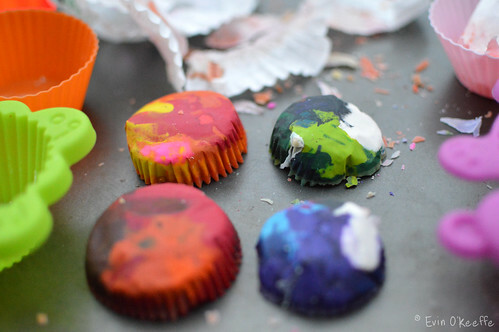 Once completely cool and set, I flipped them out and peeled off the cupcake liner paper. I didn’t really need the paper, but used it anyway. 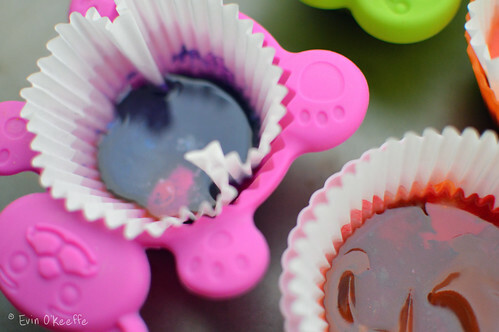 The silicone cupcake pan works perfectly and washes easily. 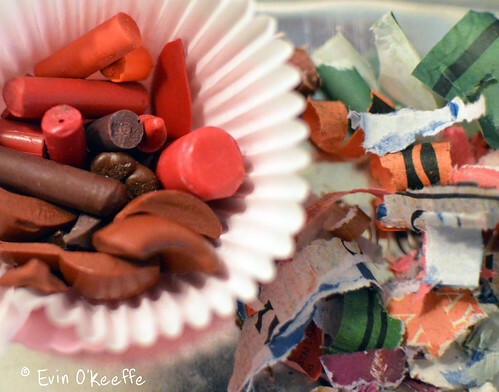 Some of the paper didn’t come out of the little nooks and crannies, but it’ll find its way out with use. I LOVE the final result and am so glad I did this again in a gradient manner. 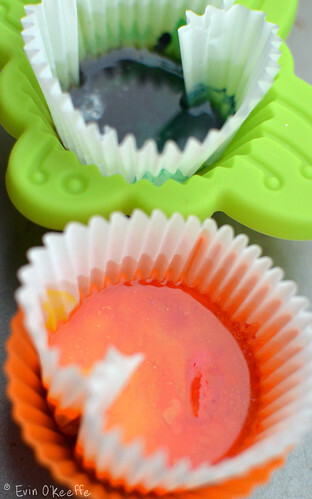 I’ll admit, the orange one is my favourite because it has a little bit of pink in it that just sings! 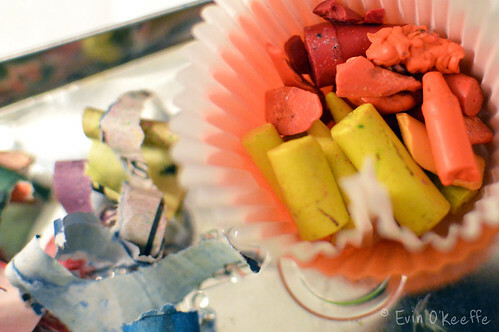 This entry was posted in Crafty Mama, Make Do and Mend and tagged phoenix crayons, upcycled, upcycling.